A Home for Every Horse Promotion! Help us share the news! 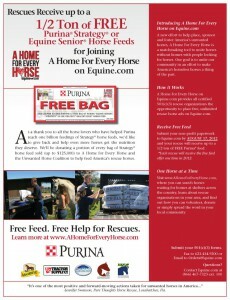 Purina Horse feed giving away $125,000 of free feed to 501(c)(3) rescue shelters as part of A Home for Every Horse! This helpful flyer explains how rescues can take advantage of this donation. 501(c)(3) rescue shelters have until August 17, 2012 to email their 501(c)(3) forms to [email protected] or fax them to 623-434-9200. This entry was posted on Tuesday, July 17th, 2012 at 8:10 pm	and is filed under News & Updates. You can follow any responses to this entry through the RSS 2.0 feed. Both comments and pings are currently closed.